Turtles and tortoises have been on the planet for 300 million years, but today, these animals are in real trouble. They are now the world’s most endangered vertebrates; half of the approximately 330 species of turtles and tortoises are threatened with extinction. The factors behind this are varied — and range from declining water quality to the loss of nesting habitats to capture for use as food, traditional “medicine” or pets. However, the greatest threat to U.S. river turtles is the demand for turtles in Asia — across the United States, river turtles are being stacked, packed in containers and shipped overseas. In Asia, turtle meat and body parts are believed to hold life-enhancing qualities. Rampant consumption has wiped out most turtle species in China, Laos, Vietnam and Cambodia. Of 90 Asian turtle species, 67 are threatened with extinction. With Asian turtles becoming harder to find, over the past decade importers turned to the United States, where wholesale turtle collection is legal in many states. The latest figures show 12 million wild-caught freshwater turtles were sent abroad from U.S. rivers in the five years between 2006 and 2011. Missouri’s Department of Conservation is taking steps to protect river turtles here. In the meantime, conservationists, like Jeff Dawson, a keeper in the Zoo’s Herpetarium, are working hard to save endangered turtles in Asia. His interest in helping turtles has taken him to Vietnam and Cambodia and with the support of the Saint Louis Zoo, most recently to China. There he is working with colleagues from two Chinese institutions — Peking University and Hainan Normal University. The work Jeff is doing with collaborating scientists includes surveys to determine appropriate study sites for further research on Asian turtle species of high conservation concern. Dawson just returned April 21 from southeastern China after collecting baseline data on the rare and enigmatic black-breasted leaf turtle. Turtles can tell us a great deal about the quality of our rivers. Most turtles are scavengers serving as the “garbage men . . . and women” of ecosystems. They clean up dying, dead and decaying plant and animal matter. 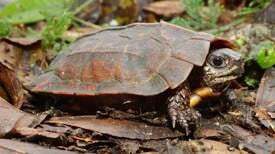 Turtles also play a role in dispersing seeds thanks to their largely vegetarian diet and migratory patterns. These cleaning and dispersing activities make them important for our ecosystems.Simply stated, turtles are part of our biological diversity and just plain amazing. The Saint Louis Zoo has been working for decades to save turtles — in fact, the oldest animals in our care are two Aldabra tortoises. They are between 120 and 130 years old and were brought to the United States in 1938. The Zoo is now home to 384 tortoises and turtles from 20 species. Many can be seen in the Charles H. Hoessle Herpetarium. The Zoo will also show off its turtles May 23 in celebration of World Turtle Day. This event will include activities and information on helping turtles in the wild and caring for these unique animals. There will be live animals to touch and bio-fact tables, crafts and other activities. The Zoo has also done its part in working to save these animals in the wilds of the New World, and central to that effort is addressing the challenges associated with the growing links between the health of human and nonhuman animals. The Institute for Conservation Medicine (ICM) researches diseases that affect the conservation of threatened and endangered wildlife species. Since 2012, ICM and its partners have been studying box turtle health in Missouri to better understand the environmental factors that may be affecting the health of wildlife and humans alike. The ICM database will help to showcase the value of box turtles as sentinels for health issues. The project is led by Zoo scientists, working closely with college and high school students, and engaging elementary school age students to get out into nature and appreciate wildlife. To begin this project, turtles in Forest Park and at Washington University’s Tyson Research Center were fitted with radio tags (VHF) that emit unique frequencies so they can be tracked. The students help scientists gather movement data points, body weights and perform veterinary checks. Blood drawn from the turtles in both rural and urban areas is analyzed for corticosterone levels (a stress-related hormone), in addition to other indicators of disease. In the preliminary data drawn from comparing and contrasting the movement patterns and health status of rural and urban turtles, urban turtles showed smaller home range sizes and higher levels of stress hormones. ICM scientists also go annually to the Galápagos Islands to continue a study of health and migration of the giant Galápagos tortoises. The Galápagos tortoise is an iconic symbol of the archipelago; yet, the health threats to these species and the science behind their migration patterns remains poorly understood. In addition to performing health assessments on these animals, the research team located and downloaded data from some of the 85 giant tortoises with GPS devices that record the location of each tortoise every hour. We firmly believe that the answer for ensuring the survival of these gentle, ancient animals is for people to care and take action to end the smuggling, exotic food industry, habitat destruction and illegal pet trade. Together, we can reduce pollution and waste and improve water quality. We can also support the organizations that are working to combat the crisis. As a first step, come to the Zoo and bring family members and friends to see these amazing creatures and to enjoy World Turtle Day May 23! This column was written by Sharon Deem, DVM, Ph.D., director, Institute for Conservation Medicine, Saint Louis Zoo, and by Jeff Ettling, Ph.D., curator of herpetology, cirector of the Center for Conservation in Western Asia and the Ron Goellner Center for Hellbender Conservation, Saint Louis Zoo.